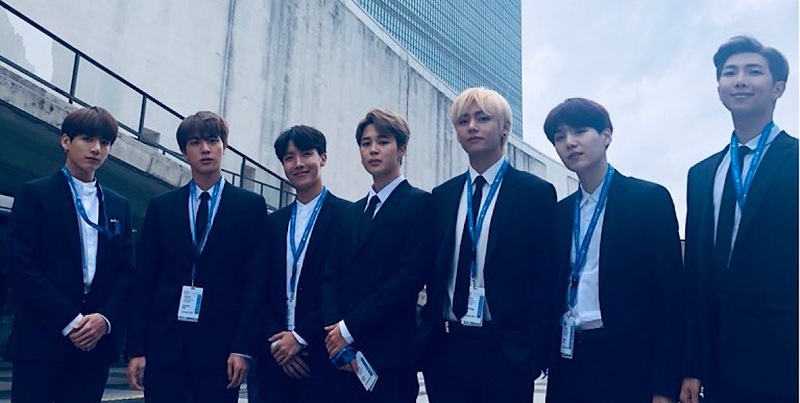 When BTS launched the Love Myself campaign in November 2017 with the United Nations International Childrenâ€™s Emergency Fund (UNICEF) Korea, its message was heard far and wide. With the campaign, expressed through the Love Yourself album series, BTS members said itâ€™s important to love yourself before you give positive love to others. A year from the campaignâ€™s launch on November 2, it has raised over $1 million. Focusing on eradicating violence against children, the campaign has inspired ARMY (BTS fans) to start various projects to spread the message. 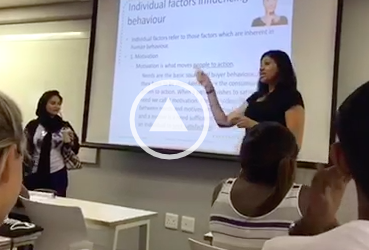 SHAAZIA EBRAHIM and FATIMA MOOSA spoke to a few fan accounts about the work they are doing in their communities. â€œThe Love Myself campaign is raising awareness that loving yourself is okay, itâ€™s not selfish. Itâ€™s about accepting yourself, your flaws, and recognising that you can change and grow and help others to change and grow,â€ main admin of the account Mymoena said. Mymoena has been running the account since April 2017 and recently found an opportunity to contribute to the Love Myself campaign focusing on local projects. Her co-admin Wisaal joined earlier this year. Together with human rights organisation the Justice Desk, BTS South Africa is raising funds for the Mbokodo Club campaign which empowers young girls in the Nyanga township with self-defence classes and self-esteem workshops. It launched on 6 October and helps the girls to â€œhave fun, work on loving themselves and loving each other,â€ Mymoena, who is also an ambassador for the Justice Desk, said. The girls also listen to BTS RMâ€™s UN speech and dance to BTS soundtracks! Wisaal bought BT21 button badges which the fan base will sell at the Burn The Stage screenings in Cape Town with proceeds donated to the project. ARMY members contribute by volunteering, spreading the word and donating money. For every R100 donated, a new girl can join the campaign. Donate to the campaign here. Their upcoming projects include raising money to take children who are underprivileged to the aquarium and a letter-writing project with messages of self love. Based entirely online, One In An ARMY is made up of more than 20 volunteers aged between 15 and 38 in 12 countries. The Twitter account was created in March 2018, and the first campaign kicked off in April. For the One In An ARMY fan base, the Love Myself message is about BTS using their platform to be a shield for the youth against violence. â€œAs ARMY, we have taken that concept to heart and made ourselves into a similar shield, determined to protect one another, BTS and others. The Love Myself campaign reminds us to first be kind and to show love to ourselves, because that is the way we are able to share love with people around the world,â€ an admin named Erika said. Soon after the fan account started, they dedicated BTS’ anniversary month June to encouraging ARMY to support UNICEF and the Love Myself campaign. Every month they choose new organisation which fans can support in BTS’ name. â€œThis way, we are able to extend that ability of our fandom to accomplish good things together to many different countries and causes around the world,â€ Erika said. 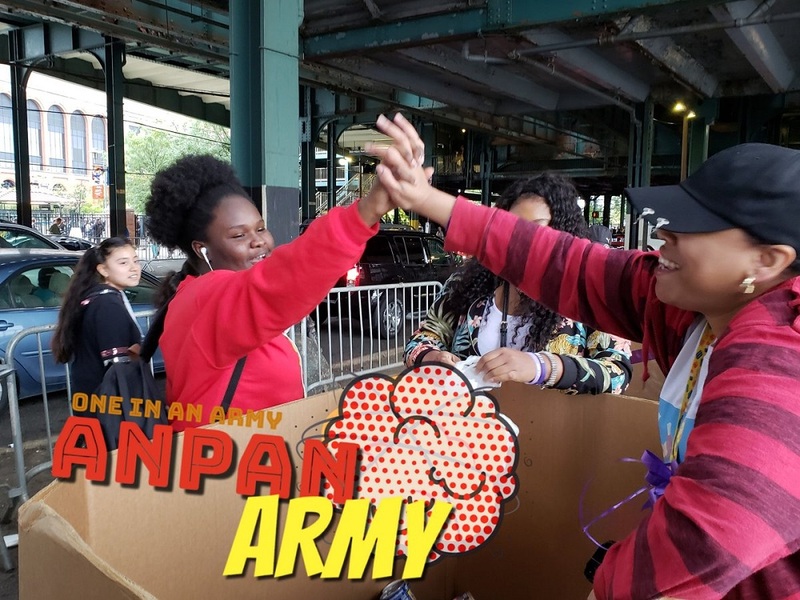 Made up of three administrators (Tagseen, Naazneen, and Nicole), the BTS ARMY ZA fan base shares relevant information around the group and encourage followers to support BTSâ€™s music, message, and philanthropic philosophy. Situated in Cape Town and Durban, the account has been active for less than a year. In October 2018, they started a donation fund which will ran until December 2018 – the funds collected will be donated in January to the Love Myself campaign. The trio have future plans to donate 8 trees to the Platbos Indigenous Forest for each membersâ€™ birthday for the coming year. â€œTo date, weâ€™ve donated for Jimin. Jin and Taehyung will be next in December. 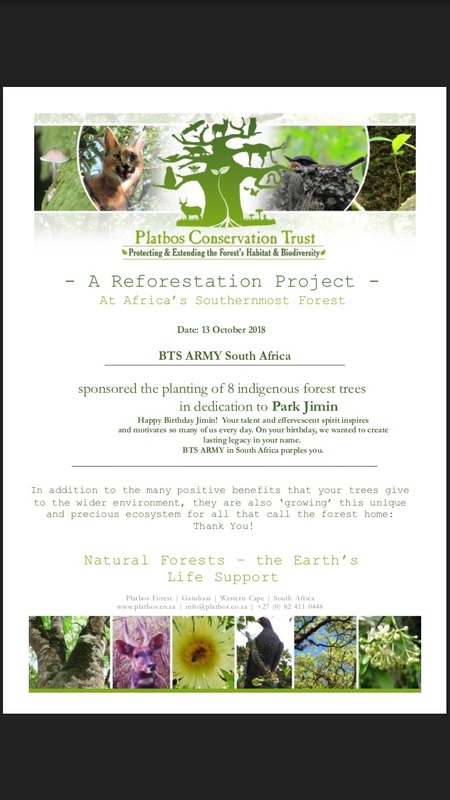 At the end of the full year, we hope to have donated 56 trees in the name of BTS and SA ARMY,â€ they said. This project for them is not just about giving back but it also about creating a lasting legacy for many generations. â€œThere are very hard situations of violence – in its multiple forms – that make children and young people totally lose hope: they surrender to follow their dreams, live happy or at least safe, and even lose the desire to live. The Love Myself campaign tries to help these people to love themselves and empower them to find their own name and voice,â€ Jessica, an admin of BTS Peru said. BTS Peru has been around since March 2013, before BTS debuted. It is situated in Lima, Peru but it has 17 sub-locations in the main cities of Peru. When BTS’ Love Myself campaign was launched, BTS Peru translated the official website into Spanish and arranged for the local press to talk about the campaign. They designed a flyer using national information on suicide rates and bullying statistics with phone-numbers of national institutions to contact for help and pushed this on social media. At the end of 2017, along with Taehyung Peru, they donated to UNICEF’s #ENDVIOLENCE campaign. The fan base has done tons of charity work including donating to children’s homes, homes for the elderly, animal shelters, and more. They are planning social projects for each BTS member, and a Christmas event with Love Myself focus where an expert will provide information on how to deal with issues like violence at school or home. â€œAs BTS become bigger, this fan base become bigger too. It means a bigger responsibility but we feel happy we can help at least a little in our society and encourage people too,â€ Jessica said. V-Taehyung Peru is BTS member Kim Taehyung’s first fanbase in Peru, and part of BTS Peru created in 2014. Although also based in Lima, the projects are carried out in several regions of the country. About the Love Myself campaign, admin member Alisson said: â€œIt inspires people of all ages to protect children, young people and vulnerable people around the world, as well as the importance of valuing themselves and others as human beingsâ€. 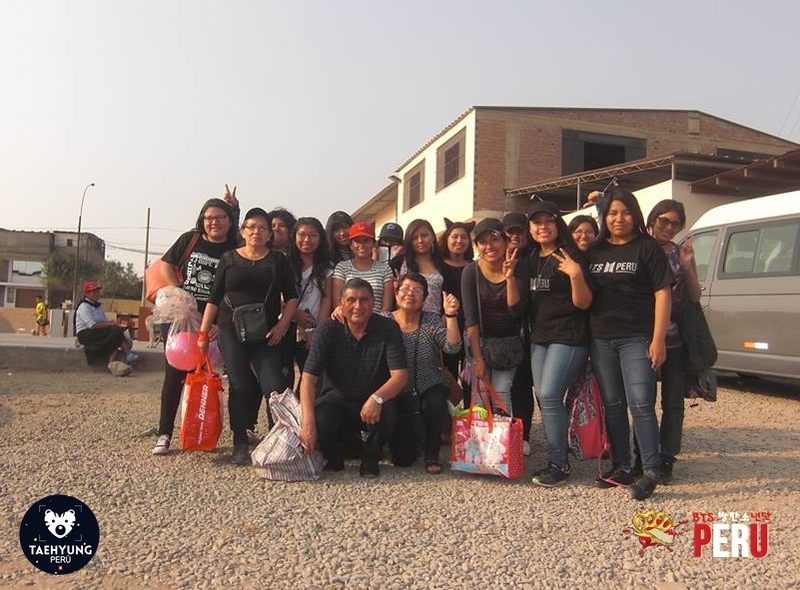 The fan base has carried out many social support projects with BTS Peru. It also organised a food, clothes, and gifts drive for children with special needs in a village in Villa Maria del Triunfo, one of the most needy localities of the city. When they donated to UNICEF Peru with BTS Peru in December 2017, they received a certificate in the name of Kim Taehyung. The fan account constantly carries out social projects for people,Â vulnerable animals or the environment, most of them released on members birthdays and other special dates. In collaboration with BTS Peru for Taehyung’s birthday this year: oral cleaning products will be donated accompanied by health talks to four educational institutions in Piura, where children are five to 12 years live in a situation of scarce resources. Located in Texas in the United States, Purple Ribbon ARMY Texas has been run by Lexi, Michelle, Elena, and Amanda since May 2018. For them the Love Myself campaign encourages people to become the best version of themselves. â€œAs RM said during his speech to the UN: its learning to â€˜love yourself for who you were, who you are, and who you hope to become,â€ they said. Their fan base has a special focus on uniting ARMY all over the world by promoting BTSâ€™ Love Yourself message through volunteer work, donations, and fundraisers. They have managed to raise $1,200 for UNICEF USA and the BTSâ€™ Love Myself campaign. Purple Ribbon ARMY Texas has also raised money for other organisations for the membersâ€™ birthdays including the Fort Worth Botanical Gardens (RM), 1Up on Cancer and the AbleGamers Charity (Jungkook), and The Safe Alliance (Jimin). For the upcoming members birthdays, the fan base are asking fans to donate to the local food bank, and animal shelter affected by the California wildfires. â€œThe Love Myself campaign that urges the youth to love themselves in order to truly love anything around them, is a positive force this world needs more than ever,â€ one of co-founders of Bangtan India Darsheeka said. 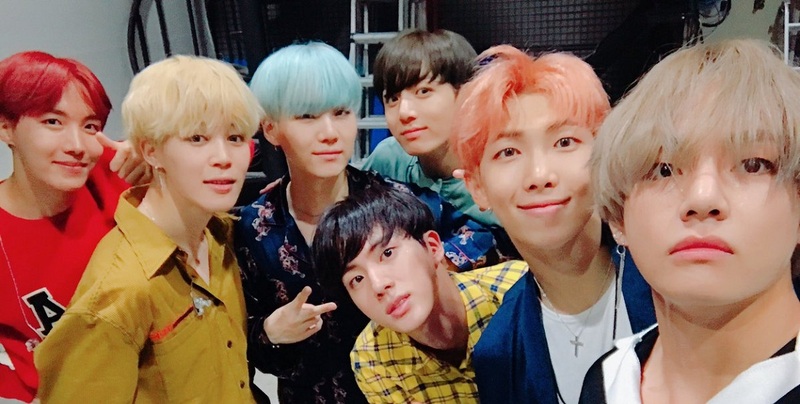 The fan base, whose Twitter account has been running since June 2016, donates in some form every year, especially to celebrate the debut anniversary of BTS. 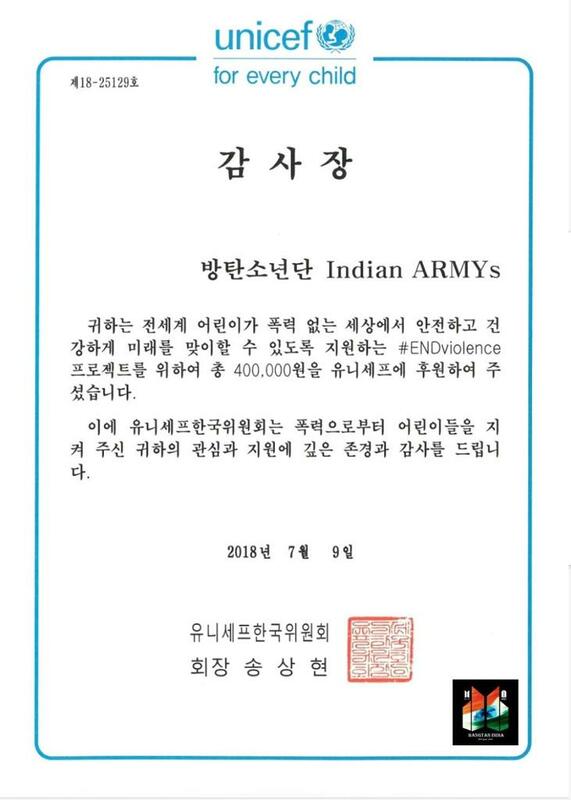 In June 2018 the fan base donated 400 000 KRW in the name of Bangtan Sonyeondan Indian ARMYs toward the End Violence campaign to Unicef Korea. They also organised a group order of 200 albums for Love Yourself ‘Her’ album where proceeds from these album sales were donated to the Love Myself campaign. The fan base has many exciting projects lined up including nationwide volunteering programs with NGO Teach for India to teach people about ending violence and the importance of loving themselves. They also plan to have nationwide food distribution/donation activities as a step towards ending hunger. â€œWe, ARMY, are immensely proud to be able to contribute to the campaign and also be instrumental towards making a change in the world,â€ Darsheeka said. Who said fan bases were just about retweeting and hyping their favs? We stan ARMYs who make a positive difference and are working to spread the message of love.